Dr. Shelley Kolton has championed women’s causes in healthcare for more than 25 years. A leading specialist in the use of transvaginal sonography in gynecology, she also has expertise in the management of menopause, using both traditional and complementary approaches. Dr. Kolton received her BA from the University of Wisconsin in 1972 and her MD from Mt. Sinai School of Medicine in 1976. She completed her ob-gyn residency at Albert Einstein College of Medicine in 1980 and was board certified by the American College of Obstetricians and Gynecologists in 1983. Dr. Leslie Gruss specializes in the non-surgical management of fibroids and uterine bleeding, as well as the treatment of Pap abnormalities and the human papilloma virus. Dr. Gruss received her BA from the University of Pennsylvania in 1979 and her MD from the Medical College of Pennsylvania in 1983. She completed her ob-gyn residency at Albert Einstein College of Medicine/Montefiore Medical Center in 1987 and was board certified by the American College of Obstetricians and Gynecologists in 1989. Dr. Audrey Buxbaum practices office gynecology. She has interests in premenstrual syndrome, the peri-menopause, abnormal uterine bleeding and the management of abnormal PAP smears and HPV infection. After joyfully delivering many babies for the past seventeen years, Dr. Buxbaum no longer practices obstetrics so that she can spend more time with her family. Dr. Buxbaum received her BA from the University of Pennsylvania in 1985 and her MD from SUNY Stony Brook in 1990. She completed her ob-gyn residency at Albert Einstein College of Medicine in 1994 and was board certified by the American Board of Obstetricians and Gynecologists in 1996. Dr. Suzanne LaJoie practices obstetrics and office and surgical gynecology, including hysteroscopy, laparoscopy and vaginal surgery. Dr. LaJoie received her BA from SUNY Albany in 1990 and her MD from SUNY Brooklyn in 1994. She completed her ob-gyn residency at Staten Island University Hospital in 1998 and was board certified by the American College of Obstetricians and Gynecologists in 2000. Dr. Dorothy Min practices obstetrics and office & surgical gynecology. She has a special interest in minimally invasive gynecologic procedures including hysteroscopy and laparoscopy. Dr. Min received her BA from Brown University in 1994 and her MD from SUNY Brooklyn in 2000. She completed her OB-GYN residency in 2004 at Maimonides Medical Center, where she was also in faculty practice before joining Downtown Women in July 2006. Dr. Min was board certified by the American College of Obstetricians and Gynecologists in 2005. Nancy Kraus is a certified and New York State licensed nurse-midwife. She graduated from Oberlin College in 1972 and then studied midwifery at Yale University, graduating with an MSN, a combined RN and CNM degree, in 1978. She has worked at several local midwifery and obstetrical practices and been active in national, state and local midwifery professional activities. At Downtown Women Ob-Gyn, she helps the obstetrical team in the care of pregnant patients in the office and does preconception counseling and well-woman gynecological visits. Nancy and Dr. Kolton have been colleagues for 24 years. Jessica Safier is a certified and New York State licensed Physician Assistant. She graduated from Oberlin College in 1993, and has been working in women’s health since her graduation from Long Island University PA program in 2000. She joined Downtown Women Ob-Gyn in 2005. Jessica provides routine gynecologic care, including birth control, diagnosis and treatment of vaginal infections, STD testing, as well as assisting with the artificial insemination program. Emory is a certified and state licensed nurse-midwife. She received a BS in Nursing at New York University in 2002, and a MS in Midwifery at SUNY Downstate in 2006. Emory worked as a registered nurse on the Mother-Baby unit at NYU Medical Center for 7 years, and as a nurse-midwife in the homebirth setting before beginning at Downtown Women OB/GYN. She provides routine gynecologic care including well woman visits, birth control counseling and management, STD screening, and diagnosis and treatment of vaginal infections, as well as prenatal and postpartum care to the obstetrical patients of Downtown Women OB/GYN. Feiyan Su is a Board Certified Women’s Health Nurse Practitioner and has joined Downtown Women OBGYN in September 2016. She completed both her Bachelor of Arts and Bachelor of Nursing from New York University. Following she earned her Master’s in Nursing from the University of Pennsylvania. Feiyan’s prior experience include 5 years at New York Presbyterian Lower Manhattan Hospital working as a Registered Nurse in Labor & Delivery as well as in the Medical/Surgical unit. A native New Yorker, she has a deep understanding of the cultural and social diversities of this city and is passionate about wellness and women’s care. At Downtown Women OBGYN, Feiyan provides routine gynecological care, contraceptive counseling, diagnosis and treatment of vaginal infections and STDs, as well as management of basic gynecologic disorders. With five obstetricians and a midwife, our obstetrics practice is intimate and accessible. We believe your involvement in your own birth process is the first and most important step toward a safe and satisfying delivery. To that end, we help you develop a birth plan consistent with your own needs and goals. Because no two patients are alike, our approach to labor and delivery is equally diverse. While we support those women who choose an epidural for pain relief, we are also advocates of labor support doulas, massage, acupuncture and hypnotherapy. We have a low caesarean section rate, we do not perform routine episiotomies and we are strong proponents of breastfeeding. We know that having your baby is one of the most extraordinary events in your life. With discussion, education, mutual trust and respect, we are confident we will help you achieve the birth experience you envision. We provide the full range of gynecologic services, from annual check-ups and routine Pap smears to surgeries performed in our offices or in the hospital. We evaluate and treat women with: abnormal Pap smears; pelvic pain; fibroids; infertility; family planning, menopause and aging issues. We perform diagnostic ultrasounds in our office. We are able to work so effectively for our patients because we not only have eleven very gifted practitioners, but we have eleven very gifted practitioners who work together as a team. As a patient, you have not one doctor but eight, as well as three nurse practitioners, a nurse-midwife, and a physician’s assistant, all of whom have either direct knowledge of, or access to, every patient’s history and needs. We share cases, discuss courses of treatment – whether routine or complicated – and take full advantage of each practitioner’s individual expertise in different areas. 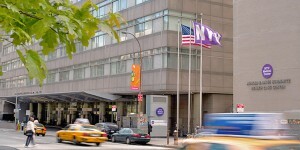 Downtown Women OB/GYN is proud to be affiliated with Tisch Hospital at the New York University Langone Medical Center located at 31st Street and First Avenue in Manhattan. As one of the preeminent medical centers in the country, we feel fortunate in our association with the Center and its incomparable staff of health care professionals. NYU Langone Medical Center has received the prestigious Magnet Award for nursing excellence from the American Nurses Credentialing Center. Only two percent of the hospitals in the country have earned this coveted award. Independently sponsored research shows that Magnet facilities have lower mortality rates, shorter lengths of stay, increased patient satisfaction and increased retention and recruitment rates among nurses – all of which benefits patients and practitioners alike. Tisch Hospital also carries the highly-coveted Baby-Friendly designation. This award was created by the Baby-Friendly Hospital Initiative (BFHI), a global program sponsored by the World Health Organization (WHO), and the United Nations Children’s Fund (UNICEF) to encourage and recognize hospitals and birthing centers that offer an optimal level of care for infant feeding.